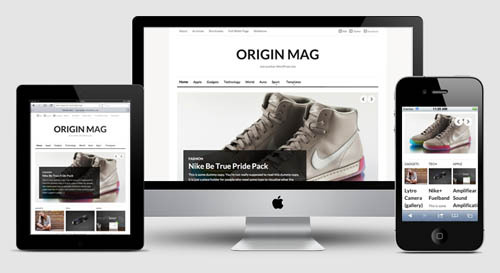 This is a collection of the best responsive magazine WordPress themes for online magazine websites. With the growing trend of viewing websites on mobile devices its essential your website displays properly and displays nicely for people viewing your site on iPhones, iPads, smart phones and all other types of mobile devices. You could make your website mobile ready using a mobile plugin or even have a separate mobile theme, but the best solution is to use a theme with an adaptive / responsive design. Responsive magazine themes are great because they give your website a professional design with a constant look and feel on all devices. It doesn’t matter if a user is viewing your website on a desktop, tablet, smart phone or any other mobile device. When using a responsive theme your website will automatically adjust to the screen size and resolution, delivering an optimized layout for that device with the same consistent core design. Magazine style WordPress themes can make your WordPress blog stand out, but these premium responsive magazine WordPress theme will make your website look hot AND future proof your website with a mobile friendly design that is accessible to everyone viewing it on anything. This is a collection of the best premium responsive magazine WordPress themes that I have found. I will be continually searching and updating this post with more high quality themes when I find them. So make sure to check back, share or bookmark this page. Extra is a powerful, stylish and completely customizable magazine WordPress theme from Elegant Themes. Powered by the Divi Builder framework, Extra has been designed specifically for the needs of bloggers and online magazine publications. 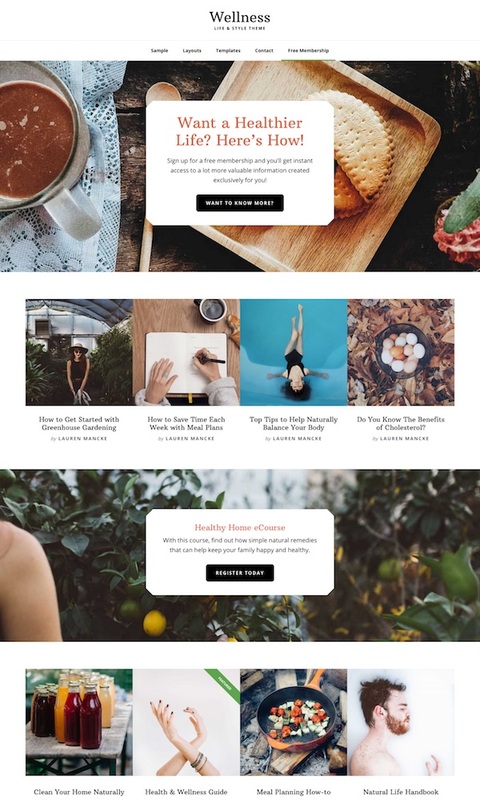 With Extra you can build countless custom homepage and category layouts as well as create stunning story-driven posts all using the easy drag and drop Divi Builder interface. Some of the other key features and benefits of the Extra theme include: a fully mobile responsive design, post and page builder, built in ratings and review system, WooCommerce compatibility and styling, social media integration, advanced drag and drop layout control and advanced design settings for total customization and control, products and projects custom post types and templates, lots of header options, advanced mega menus, custom widgets, custom page templates and post formats, advertising options and much more. 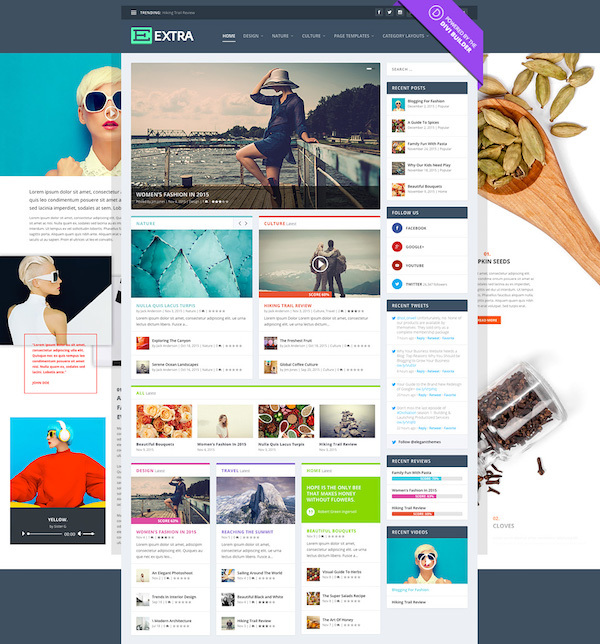 Extra really is one of the most impressive magazine WordPress themes available. Check out all the features here. 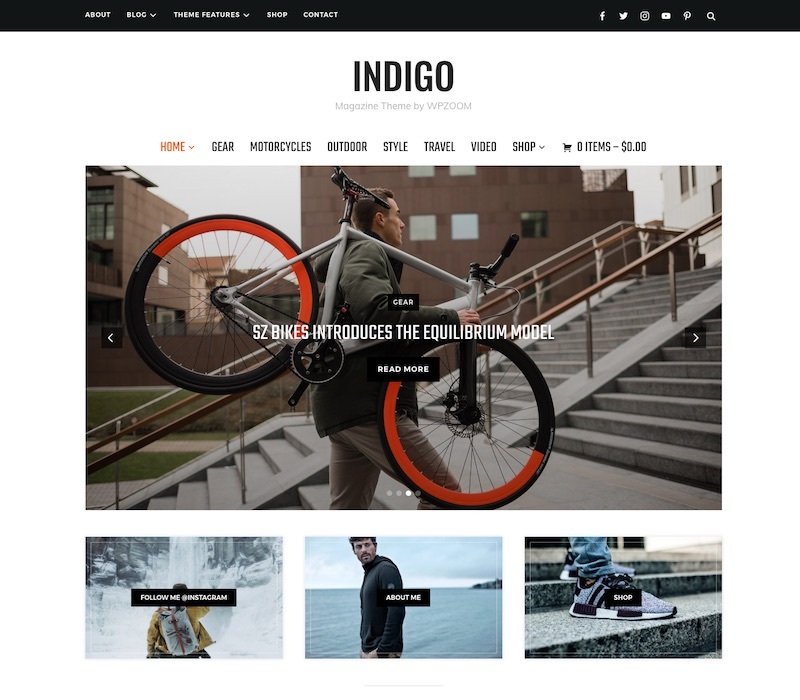 Indigo is a bold and modern magazine WordPress theme crafted for online magazines and blogs. The premium theme from WPZOOM is powerful and flexible and comes with all the features and layouts you need to take your website to the next level. The clean and minimalist design makes it ideal for almost any type of niche – food, technology, fashion, sports, lifestyle, travel or anything else. 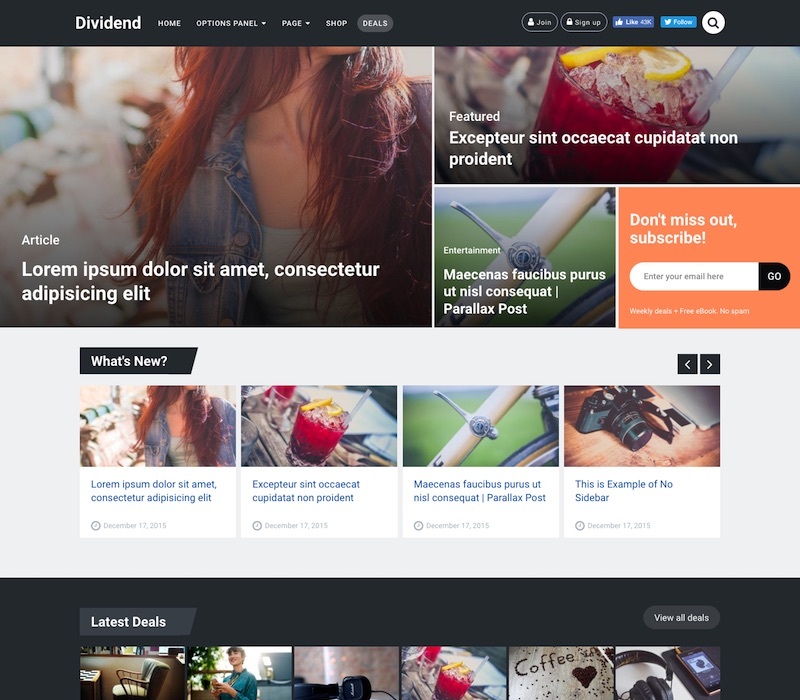 Divided is a mobile responsive multipurpose magazine WordPress theme that also comes with a custom post for deals. The premium theme from MyThemeShop comes with a variety of different layout options and is easily customizable with lots of inbuilt features and control options. You could use the theme for a creative blog, online magazine or a deals website. MH Magazine is a highly flexible WordPress magazine style theme with lots of great functionality for easily creating a modern and professional online magazine, blog, news site or other editorial project. The premium theme is fully mobile responsive and SEO optimized and includes lots of great features such as: advanced layout options with full control over your layouts, easy to use theme options, custom widgets, color pickers with unlimited color options, Google fonts, content sliders and carousels, custom logo and menus, advertising areas, social ready and much more. Monte is a stylish multipurpose magazine style WordPress theme from WPZOOM. 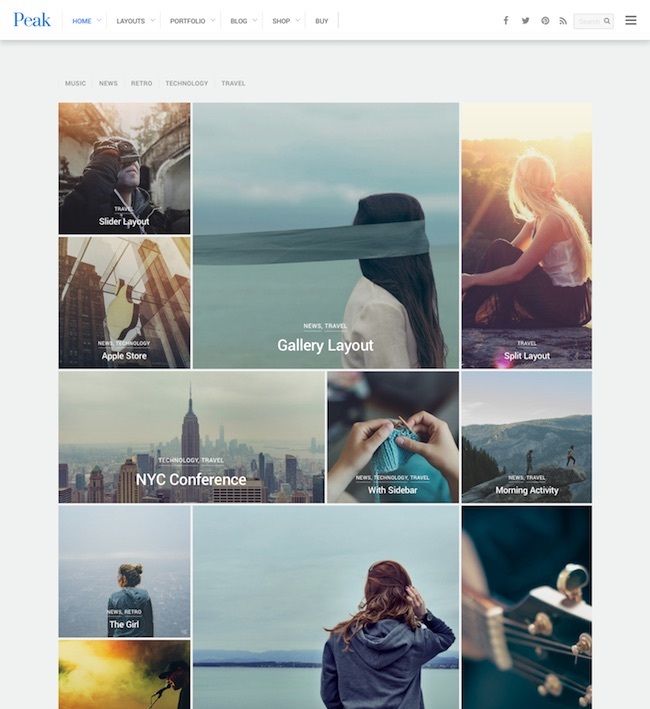 The premium theme has a clean, spacious and minimalist design with nice use of featured images to ensure your content stands out. It would be ideal for fashion bloggers and related niches or anything else. Some of the key features include: a widgetized homepage, carousel widget, visual customizer, Instagram scroller, WooCommerce support, sticky navigation menu, sliding sidebar panel, theme options panel and more. 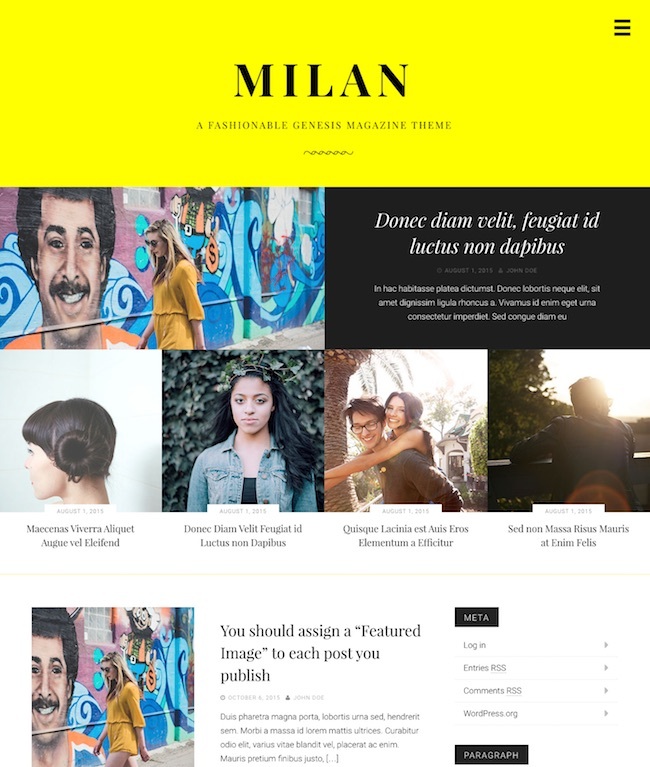 Milan Pro is a unique and fashionable WordPress child theme for the Genesis Framework. The premium third-party theme from StudioPress has a modern and stylish magazine-style design ideal for presenting magazine stories online. You could use the theme for any type of industry for an online magazine (or blog) where style, elegance and visual impact are important. Some of the key features of the theme include: a custom header, a mobile responsive design, large featured images for posts, 4 widget areas, JetPack supported featured, theme customizer, custom page templates and layout options, HTML5 markup, translations ready and more. 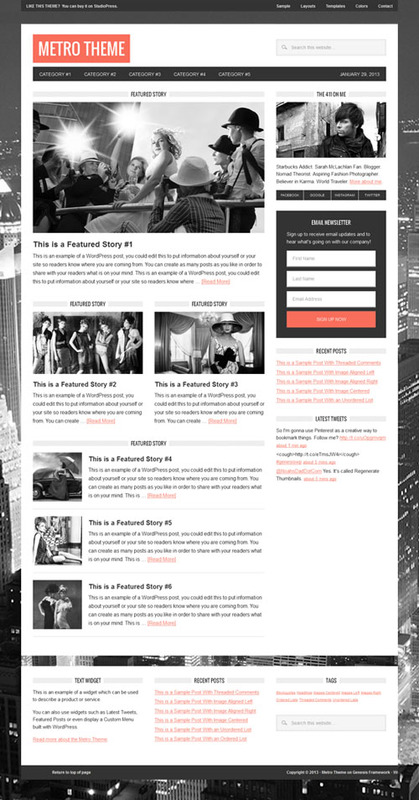 Cool as the name implies is a cool magazine blog WordPress theme from MyThemeShop. The premium theme has a versatile, stylish and modern design that could be used for all sorts of online magazine websites and blogs. It comes with four different layout options – magazine styles to simpler and very usable blog layouts. Some of the key features of the theme include: a fully mobile responsive design, multiple drag and drop sections, Adsense optimization, off-canvas mobile menu, awesome fonts and icons, unlimited color combinations, advanced typography options, RTL language support, clean commented code, powerful options panel and more. Domino is a magazine styled WordPress theme from WPZOOM ideal for online magazines or news websites. The premium theme has a complex and sophisticated design that allows you to display a heap of articles and other content on the homepage. The homepage itself is widgetized and highly customizable so you can arrange the layout to suit your needs. Some of the other key features of the theme include: mobile responsive and retina ready, visual customizer, dynamic homepage builder, carousel widget for featured content, great typography, breaking news ticker, ad ready with integrated ad spaces, weather widget, posts formats, JetPack support, complex featured category widget, ZOOM framework, and more. 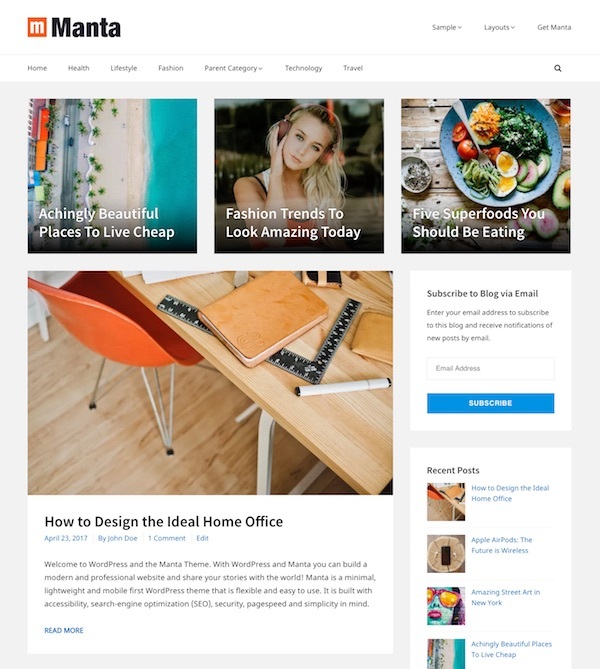 MH Magazine is a highly flexible WordPress magazine style theme with lots of great features for easily creating a modern and professional online magazine, blog, news site or other editorial project. The Technology Magazine version of the theme is ideal for blogs and online magazines about tech and gadgets, mobile phones, and related niches. MH Magazine is a highly flexible WordPress news and magazine style theme with lots of great features for easily creating a modern and professional online magazine, blog, news site or other editorial project. The premium theme has a modern, clean and versatile design perfect for vibrant and dynamic news portals and online newspapers. Daily Post is a news / magazine WordPress theme from Tesla Themes. The premium theme has a cutting edge design with lots of handy features to create a modern and visually stunning online magazine or news websites. 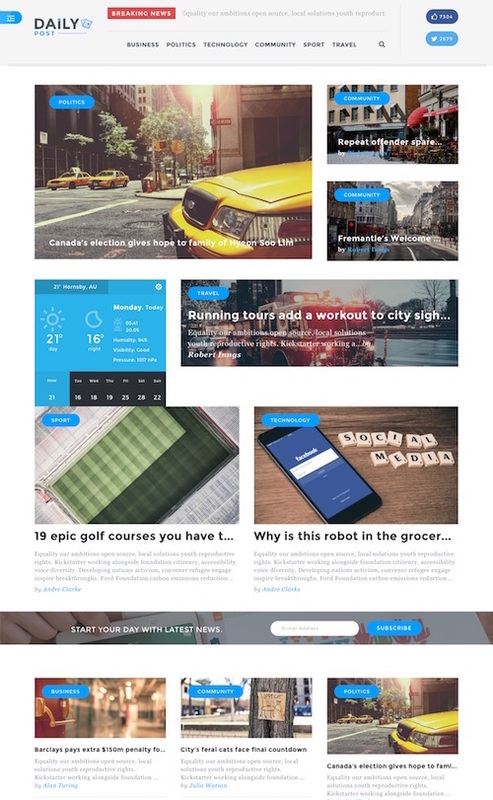 Features include: multiple featured posts layouts, several content discovery features, lazy loading, infinite scroll, reading progress indicator, weather widget and weather page, visual composer, theme options for customization, “Get published” functionality to accept news submissions, sticky popular posts sidebar and more. 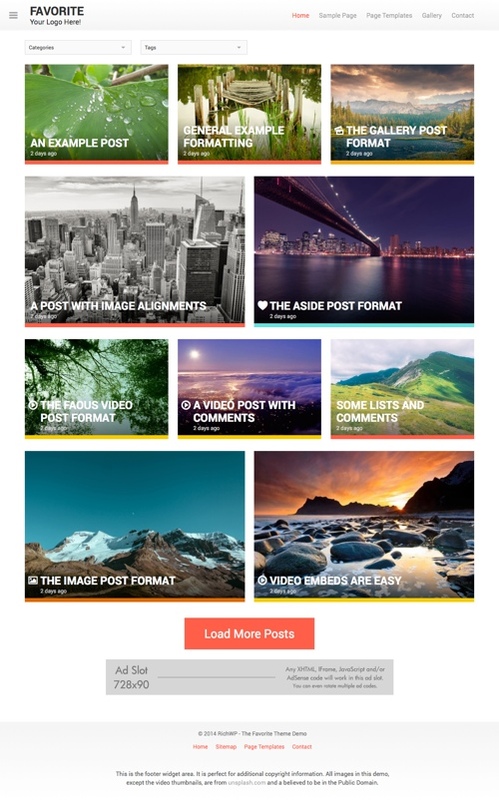 Compass is a modern and highly customizable WordPress magazine theme from WPZOOM. The premium theme has a contemporary bold and flat design with an easily configurable homepage layout. It also includes numerous handy features to enable you to build a functional and great looking online news or magazine site that people will keep coming back to. Some of the key features of the theme include: a retina ready and mobile responsive design, touch slideshow on the homepage for featured content, dynamic homepage builder with multiple widget areas so you can customize the structure, featured categories, advanced WPZOOM framework and visual customizer support so you can easily customize every detail to suit your needs, breaking news ticker, JetPack support (for Tiled Galleries, Related Posts, Extra Sidebar Widgets, etc), a selection of premade layouts for posts and pages, custom shortcodes, background and logo, menu management, HTML5 and CSS3 coding, translation ready and more. 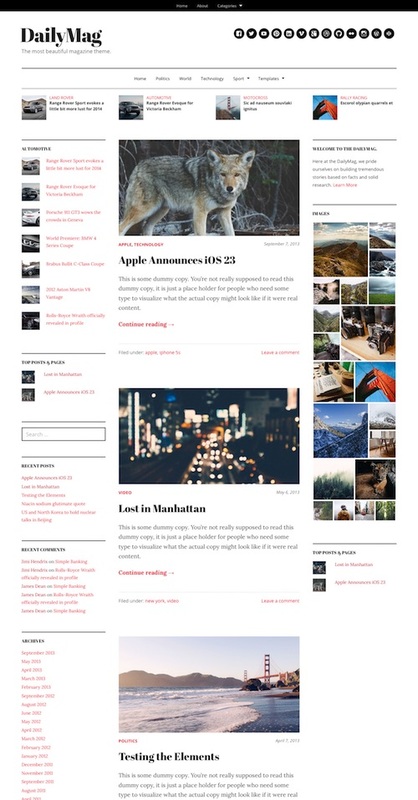 Magazine is a modern and stylish blog magazine WordPress theme from MyThemeShop. The premium theme has a custom homepage layout with an image centric design that lets you display a large amount of content. It would be ideal for product review sites, gadget blogs, news publishers, bloggers and others. Some of the key features include: 4 unique homepage designs, 2 different sluder options, multiple layouts for displaying posts and multiple post formats, related posts, scheme integrated, 100% fluid responsive design, off canvas mobile menu, Font Awesome icons, options panel, shortcodes, review plugin and mega menu compatibility, unlimited colors, sidebars and background options, Google fonts, custom widgets, and much more. Entrepreneurship is a modern and unique magazine WordPress Theme from MyThemeShop. The premium theme has a clean and user-friendly 3 column design that allows you to display a large amount of content on your homepage in a way that’s easy to digest. It comes with multiple layout options and is responsive and retina ready. Its designed to be optimized for speed and the search engines. Some of the other key features of the theme include: large featured sections, unlimited colours / backgrounds / sidebars, advanced typography options, parallax scrolling, author box, options panel, WP Review Pro and Mega Menu compatible, RTL support, translation ready, Adsense optimized, social media icons and more. 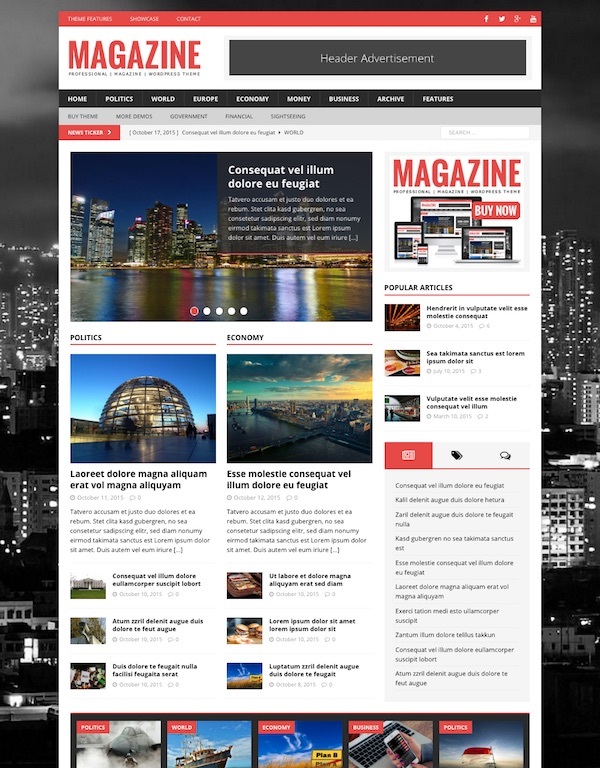 DailyMag is a blog / magazine style WordPress theme from UpThemes. The premium theme has a clean and minimalist design with a mobile first approach for a beautiful reading experience on any screen size or device. DailyMag is optimized for readability with beautiful headlines to draw people in and readable body copy to keep readers on your site, reading articles and exploring new content. The theme would be ideal for any type of blog or online magazine including fashion blogs, food blogs, fitness, news websites, video blogs, and more. Some of the other key features of the theme include: multiple layouts customizable by page or post, reading progress indicator and recommended article popup, beautiful customizable typography (600 fonts), multiple menus and 5 widget zones, customizable header, customizable colors, language support, posts by category widget, mobile friendly responsive design, JetPack support (infinite scroll, featured content etc), social media friendly, automatic updates, and more. MH Edition is a flexible and sophisticated magazine WordPress theme suitable for technology, gadget, news, and other online magazine websites. The premium theme from MH Themes is designed for sites with a lot of content to display. Its mobile ready with a responsive layout, has a nice flat design and lots of other features and options. 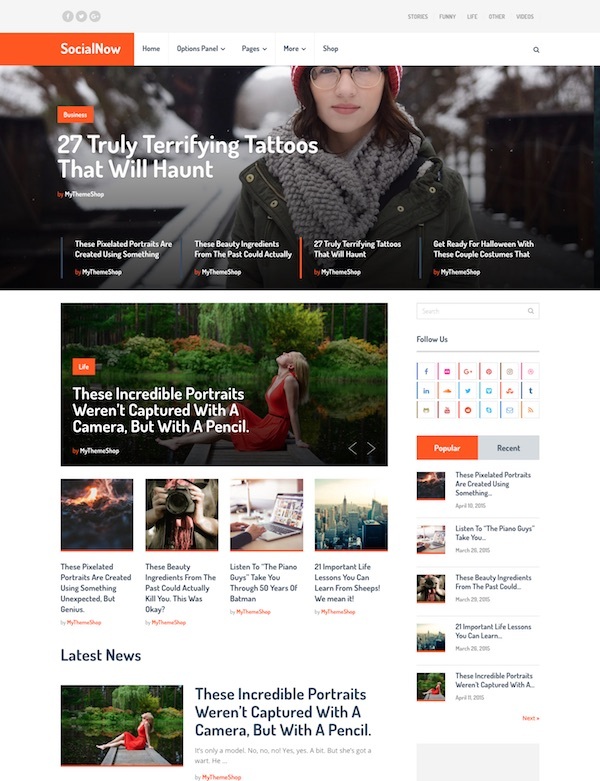 Plethora is a responsive WordPress theme for news and magazine websites. The premium theme from Rocket Theme has a modern and eye catching design with a homepage that allows you to display vast amounts of content in a coherent and integrated manner. Some of the notable features in the theme include: 6 colour style pre-sets and an extensive colour picker for individual elements, content animations, 89 widget positions, custom typography, 1200px or 960px width options, custom logo, a mobile menu, social buttons, coming soon page, and more. Delightful Pro is a fresh and colourful WordPress theme that could be used for an online magazine, personal blog or even an ecommerce site. It’s a child theme for theme Genesis Framework – probably the most popular and advanced premium WordPress theme frameworks. Some of the key features of the theme include: 4 colour scheme options, 6 layout options, WooCommerce styling (to easily add a shop section with the WooCommerce plugin), HTML5 markup and a mobile responsive design, custom logo and background options, unique category index, in-build ad spaces and more. Being a child theme for the Genesis Framework (required and sold separately) it also inherits all of its advanced functionality and features. WP-Prosperity is an advanced and beautiful mobile responsive premium WordPress theme for creative entrepreneurs. The flexible and user friendly premium theme is packed full of useful features and has a stack of design and layout options so you can use it for an attractive online magazine, professional blog or anything else. Some of the other key features of the theme include: a fully responsive layout, HTML5 coding, Google authorship support, boxed or unboxed layout, light or dark colour header, 12 homepage designs, 6 page layouts, 600+ Google fonts, numerous page templates, portfolio templates (1-4 columns), content sliders, shortcodes, advertising blocks, theme options panel and more. 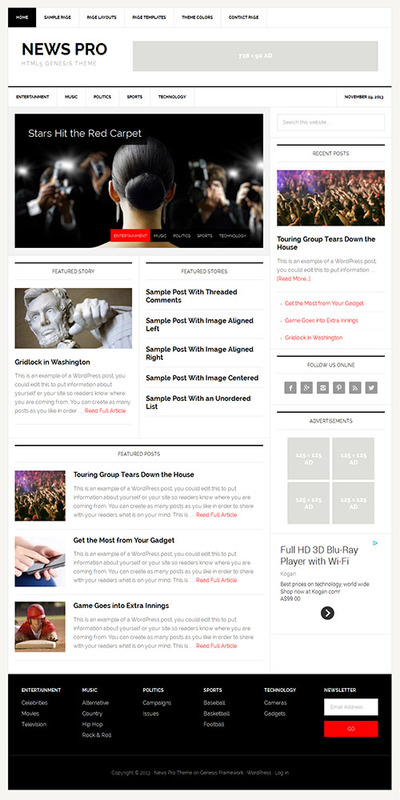 Tribune 3.0 is a powerful and professional news and magazine WordPress theme from WPZOOM. The premium theme has a mobile responsive design and offers a clean and elegant display of articles and featured content on the homepage. Some of the key features of the theme include: multiple layouts (newspaper or blog), footer carousel, video widget and other custom widgets, breaking news bar, HTML5 and CSS3 coding, shortcodes, custom background and logo, a selection of layouts for posts and pages, advanced ZOOM framework for easy customisation and more. MH Newsdesk is a mobile friendly magazine and newspaper WordPress theme from MH Themes. The premium theme has a professional and modern flat design that is highly flexible and content focused. It also has a powerful set of features. Newsdesk would work well for small, large or middle-sized news agencies, newspapers, online magazines, bloggers and others. Some of the key features of the theme include: a responsive layout, follows WordPress standards and coded with HTML5 and CSS3, Google webfonts, 14 widget locations, custom widgets, advertising placements, featured images, related posts, news ticker, author box, custom header and backgrounds, translation ready and support for RTL, flexible layout options, theme customizer and more. Gazeti is a stylish and modern magazine WordPress theme with a mobile friendly responsive layout. The premium theme from WPZOOM has a clean and well structured design so readers can access your content quickly and easily. It’s also packed full of features so you can easily control and customise the layout and design of your site. Some of the other features of the theme include: a nicely structured and completely widgetized homepage, 3 unique colour styles, a mobile responsive layout, theme options panel and easy customisable options, menu management, custom shortcodes, a selection of pre-made layouts for posts and pages, translation options, custom background and logo input, automatic framework updates and more. Games Zone is a new premium gaming WordPress theme from ThemeFuse. The mobile responsive theme has a fresh and professional design that is ideal for gaming magazine, gaming blogs and gaming review websites. The theme offers some great features for gaming websites and has a handy admin panel to easily customise and control the site. Game Zone allows you to add and filter game reviews, games, ratings and comes with a bunch of specific pages like reviews, games, walkthroughs, guides and more. Some of the other interesting features of the theme include: built in advertising options, shortcodes, events calendar, a mobile responsive design, infinite colour options, textures and background images, one click auto install, Google fonts, custom widgets and more. 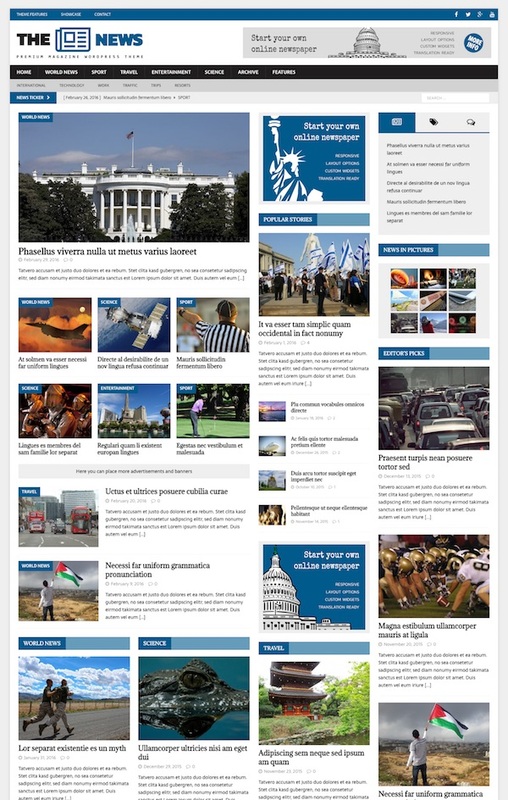 News Times is an attractive and unique magazine WordPress theme with a mobile friendly responsive design. The premium theme from My Theme Shop has a built in review system for reviews. It has a homepage layout manager with various layout options, a control panel that lets you customise all the major elements of the theme, and unlimited sidebars and colours. Other features include: an off canvas mobile menu, Google fonts, infinite scrolling option, rich snippets support, shortcodes generator, one click install, ad management and more. Novelty is a magazine theme for WordPress with a bold, modern and mobile responsive design. The premium theme from Tesla Themes could be used for blogs, news websites, online magazines, a content sharing website or anything else. Novelty is powered by Tesla Framework, a powerful framework and administration tool that allows you to easily customize the look and functionality of your theme without needing to be a coder. Some of the other key features of the theme include: a slider, custom posts (Services, Testimonials, Team Members, Calendar, etc. ), built in shortcodes, social media integration, WPML support and more. Lucid is a sleek, minimalist magazine WordPress theme from Elegant Themes. The modern premium theme has clean design elements and a strict grid structure which allows you to display lots of content, but still maintain hierarchy and readability while avoiding clutter. The magazine style theme also has a mobile responsive layout that will adapt for mobile phone and tablet users providing an optimized viewing experience. Other features include a large collection of shortcodes so you can create beautiful and complex layouts, custom page templates, 5 unique colour styles, and an extensive options panel that allows you to easily control your website without ever touching a line of code. Neuton is an attractive news / magazine WordPress theme with a responsive layout from cssigniter. The premium theme has a heap of powerful features and is highly customisable. You can customise the theme to your liking via widgets and it includes 7 different of category layouts and reviews. Neuton also has a Trending Topic algorithm to promote your most discussed topics. Other features include: a mobile responsive design, various shortcodes, 7 different colour schemes, custom menus, theme options and more. Metro is a modern magazine WordPress theme with a mobile optimised responsive layout from StudioPress. The premium theme is a very spacious 1152 pixels wide, and the “flat design” gives it a very modern look. The mobile responsive layout ensures your website will look great on large wide screen monitors right down to tablets and small mobile displays. Metro comes with 5 colour styles, 6 layout options, sleek social features, custom background, header and menu options, featured images, a landing page template and more. Metro is a child theme for the Genesis Framework so includes all the other features and benefits of that excellent theme framework. Magazine Explorer, as the name suggests is a stylish magazine style WordPress theme from WPZOOM. The premium theme has a very clean, minimalist design with a mobile responsive layout that automatically adjusts for any screen size and resolution. Magazine Explorer has a widget based layout for greater flexibility and customisation possibilities. Other features include a featured slideshow on the homepage, carousel widget, advanced WPZOOM framework and options panel, several custom widgets, banner management options and more. Focus is an impressive mobile responsive magazine and news WordPress theme from Design Wall. The premium theme has a neat and clean design perfect for any modern news or online magazine websites. The homepage lets you displays lots of content with a featured news carousel, sections for popular / recent articles, and category sections with the latest articles. It also has a trending news ticker, video section, and an automatically updated “must read” article drop down section which displays the 15 latest news articles. It has 6 different styles for categories which can be displayed as a grid or a list. Some of the other features include: a mega menu, quick tabs, detailed typography page, easy and powerful theme options, HTML5, LESS & Bootstrap, integrated banner ad spots, mobile responsive layout and more. Magazine is an incredibly powerful and flexible responsive magazine WordPress theme with an intuitive drag and drop builder that allows you to build any kind of layouts you like with ease. The premium theme from Themify allows you to create unique complex grid layouts just like the big name news and magazine websites. 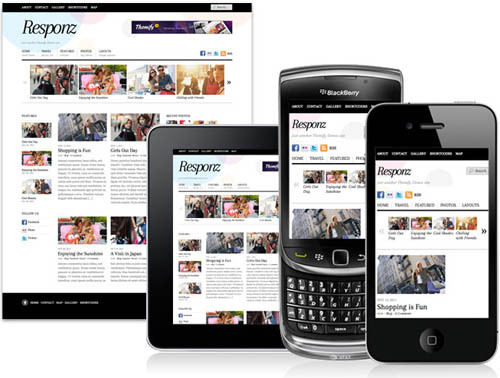 The theme is retina and mobile ready with a responsive design. Some of the other features include: mega menus and a nice slide out menu for mobile, 42 pre-built layout options, Awesome icon fonts, breaking news ticker, advertising widget areas, control panel with extensive styling options, related posts, social sharing icons and more. 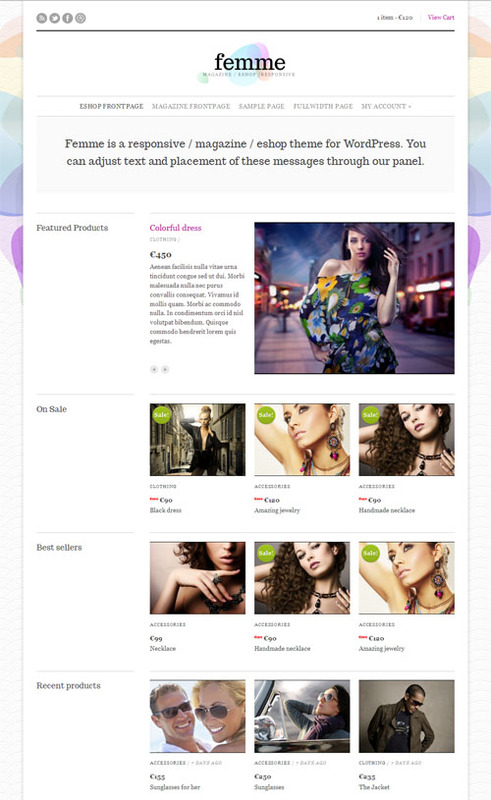 Isabelle is a beautiful mobile ready responsive WordPress theme for women wanting a chic and feminine website design. The pretty premium theme from BluChic is ideal for stylish blogs and magazine websites about all sorts of women’s interests. Isabelle theme would work great for websites about home living, lifestyle, crafts, clothing and fashion, makeup, baby and parenting, decorating, weddings or any other niche. The Isabelle theme can be used as an online magazine or a blog. It gives you the option to have a magazine layout with excerpt post and thumbnail in two columns (pictured), or a full post blog style layout. Some of the other features include: a large featured slider on the homepage, colour wheel picker to change your colour schemes, theme options panel, custom logo uploader, custom shortcodes (for columns, button, contact forms, accordion, info boxes etc), localization support and more. 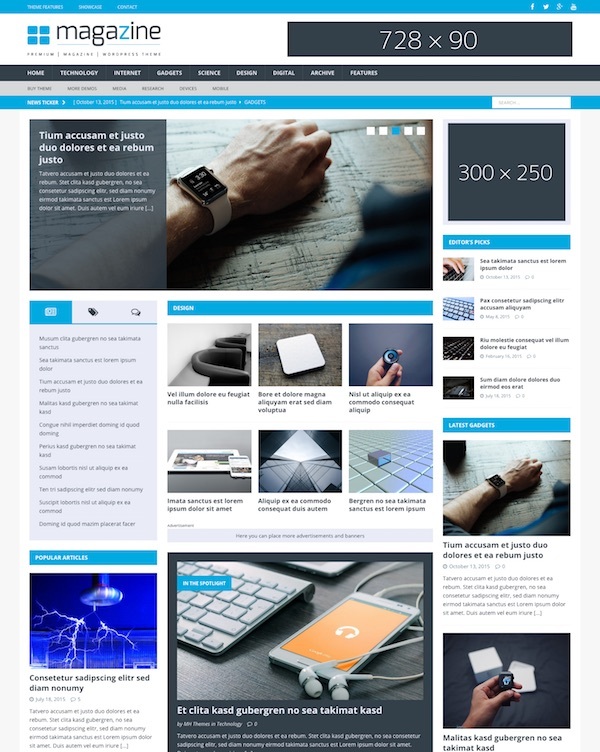 Tech News is a news / magazine WordPress theme from Templatic designed for pro bloggers looking to build a tech news site similar to TechCrunch, Mashable or CNET. The theme has a mobile responsive design meaning it will scale to fit on all browser widths / resolutions and on all mobile devices. Other features include a featured content slider and highlighted stories section, list or grid view layout options, custom widgets, custom control panel and more. 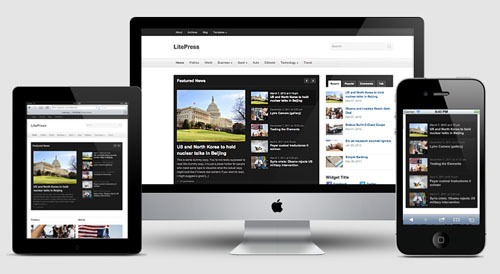 LitePress is a premium responsive magazine WordPress theme from WPZOOM. The theme has a clean, minimalist design but is packed with features to quickly setup up a professional news or magazine website. Features include and advanced framework options panel to easily customise various elements, featured homepage slideshow, featured category sections, video custom posts types, a mobile responsive design and more. Femme is a responsive magazine AND ecommerce WordPress theme from cssigniter with a clean minimalist design. The theme has a multiuse, flexible structure and can be a magazine website, an ecommerce store or a combination of both. Ecommerce functionality (if required) is powered by the powerful WooCommerce ecommerce plugin. The theme has alternative layout options, mobile responsive design, shortcodes, theme options and more. Balance is a responsive premium WordPress theme for the Genesis Theme Framework from StudioPress. The theme features a mobile responsive design meaning it will automatically adapt and look great on all devices and screen sizes. Other features include 5 colour schemes, 3 layout options, landing page template, portfolio page templates, custom background, featured images and more. Responz is a highly flexible and customisable responsive WordPress theme from Themify designed for magazine, news and editorial websites. The premium theme has a minimal and elegant design with beautiful typography. It has many layout options, and you can choose from choose from 2 sidebars, 1 sidebar, left or right sidebars, or fullwidth along with various list view and grid view post layouts. Other features include customisable dual navigation menus, 8 colour scheme options, header and footer sliders, theme options panel and more. A stylish magazine WordPress child theme that runs on the Genesis theme framework from StudioPress. The premium theme highlights your content and has a beautiful, clean and fresh design ideal for a food blog or food magazine website. It has a mobile responsive layout meaning it will automatically adapt its design to any screen size and device to look great on iPads, iPhones and all other mobiles devices. Innov8ive has 3 colour schemes, 6 post / page layout options, custom header, menus and background options, featured slider, theme options panel and more. 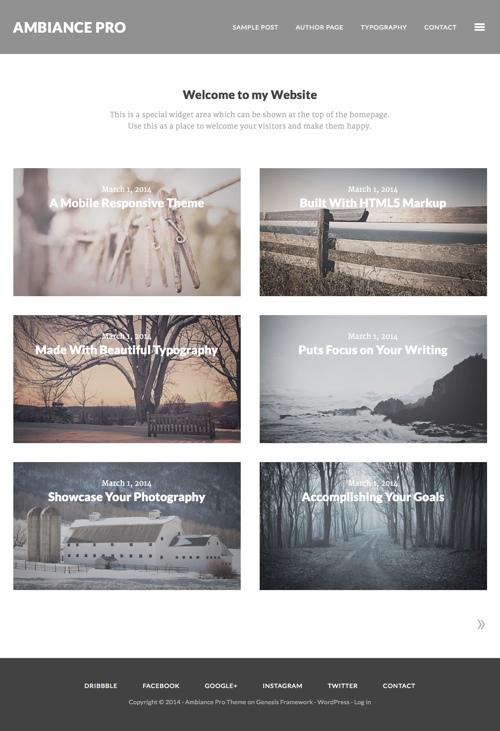 Horizon is a modern magazine WordPress theme with a responsive design from WPZOOM. The premium theme has a bold, clean design ideal for car, sports, technology, and video game websites, or really any other type of website. It has 8 built in colour schemes to choose from, a custom homepage design with featured posts slider, built-in social sharing buttons, as well as detailed author profiles. It has 3 custom layout options or posts and pages. The theme is built on the WPZOOM Framework with and extensive options panel that lets you easily setup and customise your theme to your needs. The responsive design means its mobile ready and will automatically adapt to fit on any screen resolution on desktop and mobile devices. NewsSetter is a slick and modern magazine WordPress theme perfect for technology or gadget review websites. The premium theme from Theme Fuse could of course be used for any type of website wanting a modern and eye catching design. The theme has a couple of different header styles, 4 colour variations, the ability to set any shade you’d like for the texts and titles, from a easy-to-use colour picker. It has special review page templates with all the features your need to present your product reviews. There are also other custom page templates and lots of shortcodes to style and present information in a beautiful way. The theme also sports a mobile responsive design so will it doesn’t matter if your visitors are viewing on a desktop, tablet or smartphone they will get an optimized experience. The Chronicle is a responsive magazine WordPress theme from WPZOOM. The premium theme has a clean and simple design with great readability so you content really is the focus. It also has a responsive layout making it mobile ready and accessible on any device from desktops to mobile phones. The theme has a modern blog / magazine styled homepage layout which is uncluttered and easy to read. Other features include: the advanced ZOOM framework and options panel, custom shortcodes, styled sticky posts, custom background, menu and logo options, a selction of custom template layouts for posts and pages, and more. Valenti is a beautiful, feature rich review magazine WordPress theme with a retina ready and mobile friendly responsive design. Some of the items in the extensive list of features in the theme include: a drag and drop homepage builder, powerful options panel, unique mega-menu system, 5 post featured image style options (with parallax effects), slide out mobile menu, rich snippet support, boxed or full width layouts, integrated review system with user ratings, post formats for video and audio, numerous custom page templates and widgets, lots of homepage, category and post layout options, colour styling options and much more. 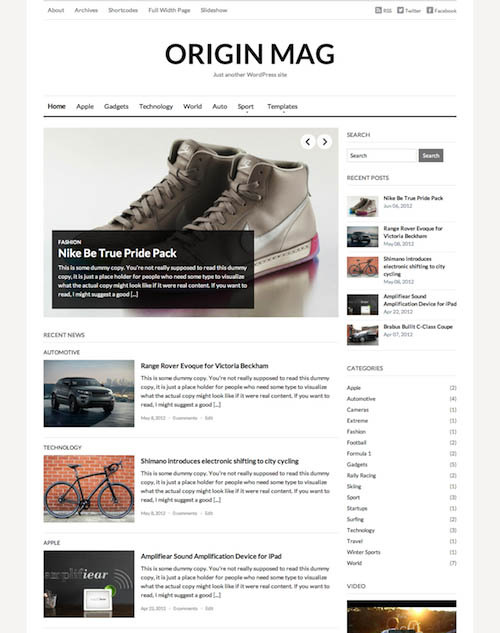 Lifestyle is a stylish responsive blog / magazine WordPress theme for the Genesis Framework. The premium theme from StudioPress features bright colours, clean layouts and clear menus. It’s compatible with Genesis 2.0 and powered by HTML5 and a responsive design making it mobile ready. Lifestyle Pro would be ideal for websites about health and fitness, food and cooking, home and lifestyle, design and fashion or simply a personal website to share your life. The Lifestyle Pro theme features include: 6 different colour styles, 6 smart layout options, custom header and background, featured images, landing page template, footer widgets, and all the other great features of the Genesis Framework. Eeny Meeny is a flexible blog / magazine WordPress theme designed for women. 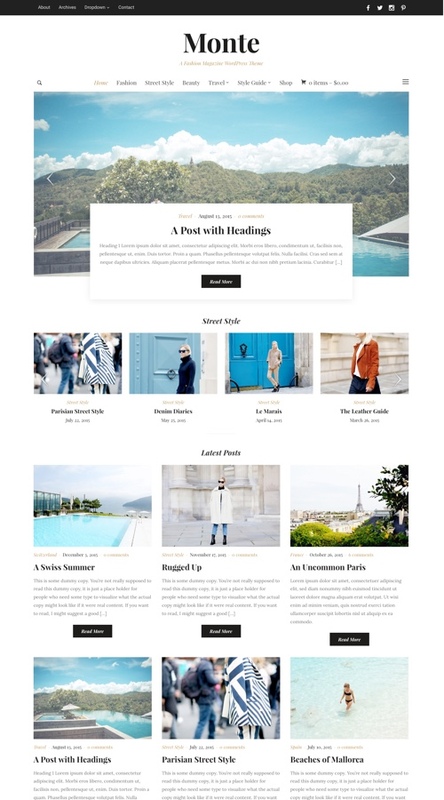 The premium theme has a clean and simple design with a vibrant colour palate ideal for a personal blog or online magazine websites about fashion, home decorating, interior design, food, women’s interests or anything else. It has a responsive design and adapts to display nicely on desktops, tablets and mobile phones. Some of the other key features of the Eeny Meeny theme include: 6 layout options, 31 colour schemes, optional featured slider, header and footer options, 600+ Google fonts, post and page layout shortcodes, translation ready, theme options panel and more.